This stunning traditional style lateral file will be a functional addition to your home office. The piece has two spacious extending lateral file drawers, making it easy and convenient to store documents at home. A clean and classic style on this piece features pretty crown molding, and antique style metal hardware. This lateral file will be a sophisticated accent in your home office. 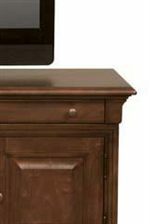 The Classic Two Drawer Lateral File by Winners Only at Crowley Furniture & Mattress in the Kansas City Area: Liberty and Lee's Summit, MO & Overland Park, KS area. Product availability may vary. Contact us for the most current availability on this product. Filing Capabilities Some office pieces feature legal/letter file accommodations. 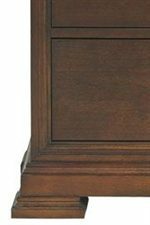 The Classic collection is a great option if you are looking for Traditional furniture in the Kansas City Area: Liberty and Lee's Summit, MO & Overland Park, KS area. Browse other items in the Classic collection from Crowley Furniture & Mattress in the Kansas City Area: Liberty and Lee's Summit, MO & Overland Park, KS area.